Compulsive eating behavior is a pathological form of feeding that phenotypically and neurobiologically resembles compulsive-like behavior associated with both drug abuse and behavioral addictions. Compulsive eating behavior, including Binge Eating Disorder (BED), certain forms of obesity, and 'food addiction' affect an estimated 70 million individuals worldwide. 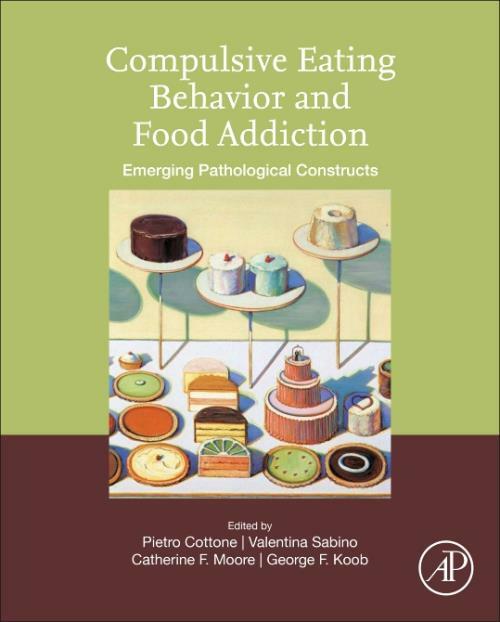 Compulsive Eating Behavior and Food Addiction: Emerging Pathological Constructs is the first book of its kind to emphasize food addiction as an addictive disorder. This book focuses on preclinical aspects of food addiction research, shifting the focus towards a more complex behavioral expression of pathological feeding combining with the current research on neurobiological substrates. This book will become an invaluable reference for researchers in food addiction and compulsive eating constructs. Dr. Cottone is co-director of the Laboratory of Addictive Disorders. Dr. Cottone's research interests focus on the neurobiological substrates of motivated behaviors including feeding and addiction. The major goal of Dr. Cottone's research is identifying the biological bases of and potential treatments for eating disorders and obesity. Current studies concern the role of stress in compulsive eating and palatable food dependence. Areas of focused research include the investigation of the neurobiological bases of stress-related disorders such as anxiety and depression. Dr. Cottone's studies are carried out on environmental and genetic animal models, using behavioral, biochemical, and molecular approaches. Dr. Cottone co-directs a graduate course in neuropsychopharmacology offered for the first time in Fall 2010 which examines the interaction between behavior and classes of drugs that affect the central nervous system. Catherine Moore is currently a fourth year doctoral candidate in Neuroscience with a specialization in Biomolecular Pharmacology at Boston University under the advisement of Dr. Pietro Cottone. Ms. Moore is expected to earn her Ph.D. in the Spring of 2019, which will include a Certificate in Addiction Science. As an undergraduate, Ms. Moore studied Psychology and Cognitive Science at the University of Virginia, and graduated in 2012 with high distinction. During this time, she studied the neurobiological bases of nicotine and alcohol addiction using animal models, investigating effects of exercise, hormones, and pharmacological treatments on drug-taking behaviors. Her current research interests encompass addictive behaviors and compulsivity, and since beginning graduate school she has published numerous original and review articles investigating and delineating the underlying causes of food addiction and compulsive eating. She was awarded the Ruth L. Kirschstein National Research Service Award (NRSA) from the National Institute on Drug Abuse for her research in this area. Catherine is also a fellow of Boston University's Transformative Training Program in Addiction Science, a program built upon cross-disciplinary and co-mentoring training of scientists to bridge the gaps present in the varying addiction research disciplines and public health. Dr. Sabino is co-director of the Laboratory of Addictive Disorders, and is currently researching the neurobiology of addiction and stress-related disorders. Studies on addiction aim to understand the neurobiological substrates of alcohol abuse and dependence by exploring the role of neurochemical systems in excessive alcohol drinking. Dr. Sabino is working toward the development of new therapeutic agents to alleviate alcohol addiction. Animal models for excessive drinking are studied in order to identify compounds for potential clinical development. Research is also conducted on the neurobiology of stress-related disorders such as anxiety and depression. The approach of the laboratory is interdisciplinary, involving behavioral neuroscience, neuropharmacology, neuroanatomy, biochemistry and molecular biology. Dr. Sabino co-directs a graduate course in neuropsychopharmacology offered for the first time in Fall 2010 which examines the interaction between behavior and classes of drugs that affect the central nervous system giving emphasis on how behavioral studies can assist in our understanding of mental disorders. Dr. Koob is an internationally-recognized expert on alcohol and stress, and the neurobiology of alcohol and drug addiction. He is the Director of the National Institute on Alcohol Abuse and Alcoholism (NIAAA), overseeing a broad portfolio of alcohol research ranging from basic science to epidemiology, diagnostics, prevention, and treatment. Dr. Koob earned his doctorate in Behavioral Physiology from Johns Hopkins University in 1972. Prior to taking the helm at NIAAA, he served as Professor and Chair of the Scripps' Committee on the Neurobiology of Addictive Disorders and Director of the Alcohol Research Center at the Scripps Research Institute. Early in his career, Dr. Koob conducted research in the Department of Neurophysiology at the Walter Reed Army Institute of Research and in the Arthur Vining Davis Center for Behavioral Neurobiology at the Salk Institute for Biological Studies. He was a post-doctoral fellow in the Department of Experimental Psychology and the MRC Neuropharmacology Unit at the University of Cambridge. Dr. Koob began his career investigating the neurobiology of emotion, particularly how the brain processes reward and stress. He subsequently applied basic research on emotions, including on the anatomical and neurochemical underpinnings of emotional function, to alcohol and drug addiction, significantly broadening knowledge of the adaptations within reward and stress neurocircuits that lead to addiction. Dr. Koob has authored more than 650 peer-reviewed scientific papers and is a co-author of The Neurobiology of Addiction.